Now that I’ve been gardening for quite a while I don’t need plant tags to identify what’s growing in my garden. But it certainly doesn’t mean I don’t enjoy making them and displaying them! 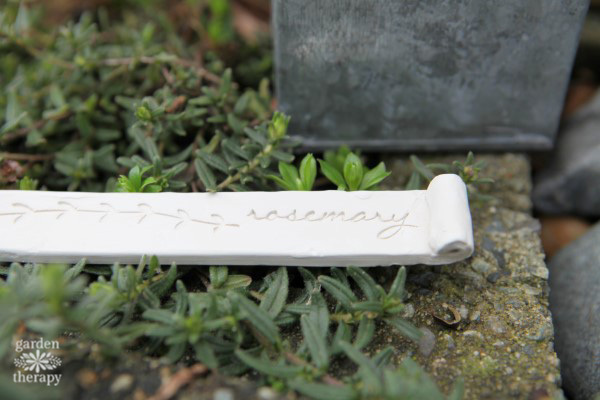 These clay plant stakes are made from air dry clay and rubber stamps. 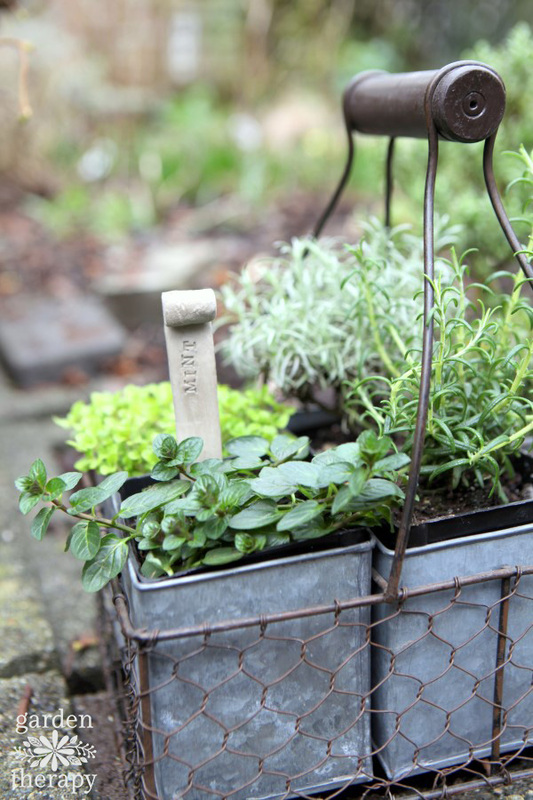 They can be used to identify herbs or add a personalized message when giving plants as gifts. 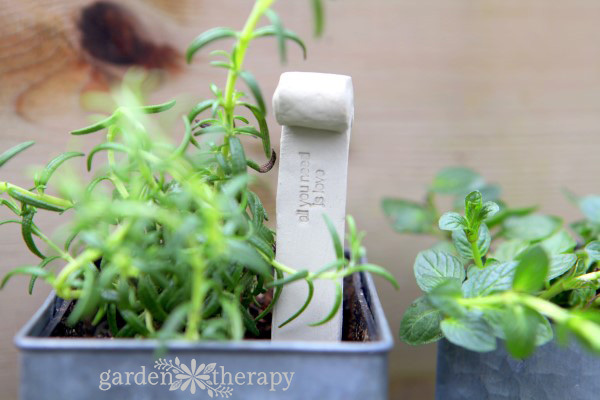 I can imagine these clay plant stakes would be right at home as wedding favors or table decorations for a garden wedding. They would be beautiful adorning a Mother’s Day gift, housewarming gift, or even a birthday present as well. Oh, the possibilities! I must warn you however that working with air dry clay is incredibly addictive. 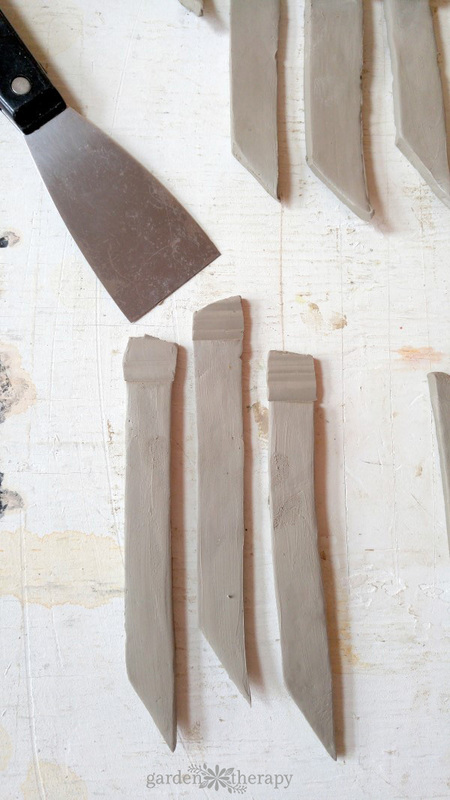 Once you get started molding simple projects like these clay plant stakes, your mind will be dancing with all the ideas of things you can make with clay as you dream at night. But for now, let’s start with this simple project and see where it takes you! 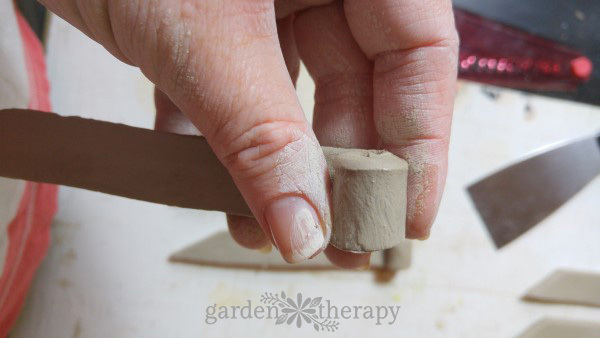 Start by cutting off a chunk of clay from the block. 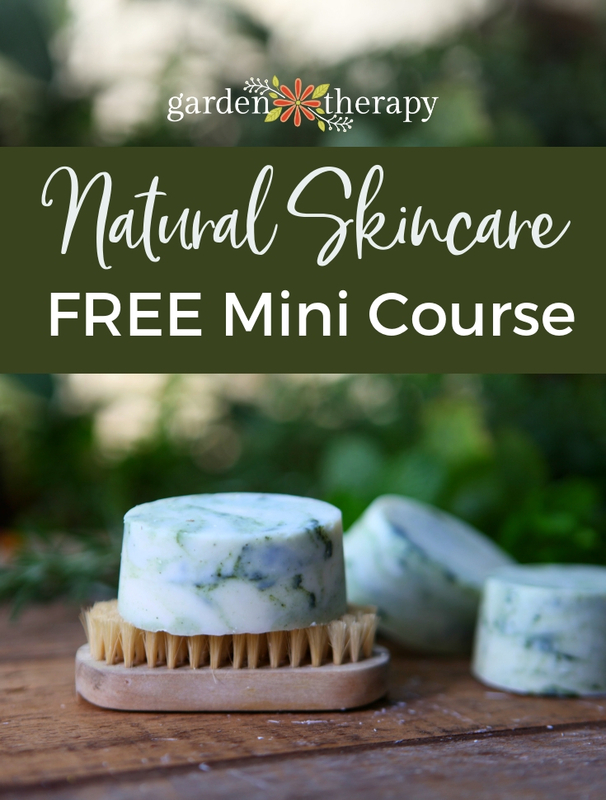 The easiest way to do this is to use a long piece of dental floss twisted around your two index fingers, pulled taught, and used to slice through the clay. A knife will get stuck in the clay, but string or floss will cut a section clean off. 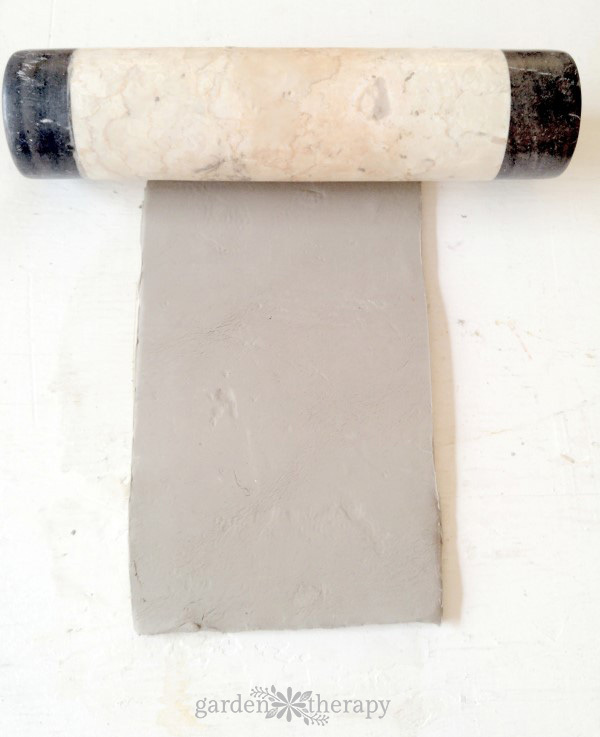 Use heavy rolling pin to roll out the clay to 1/8 inch thick. 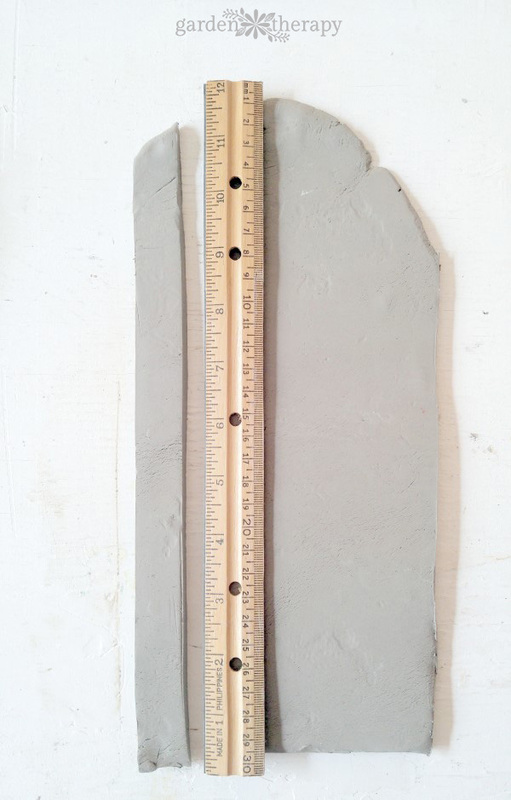 Use the knife to trim the edges off the clay to form a rectangle approximately 11 inches long by 6 inches wide. 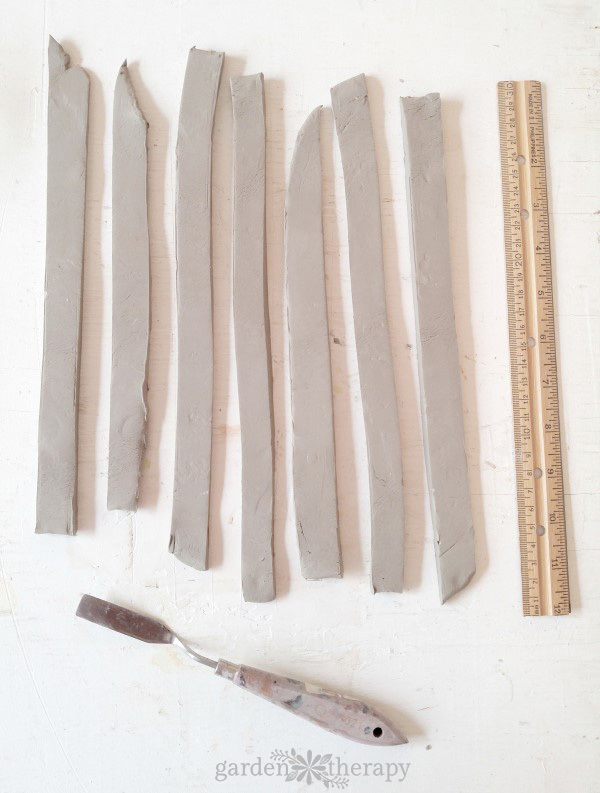 Using a ruler as a guide, cut the clay into seven equal strips approximately 3/4 inch each. Make a diagonal cut in the center of each of the strips creating a pointed end. Use a flat edge tool to gently flatten out the top inch or so of each of the strips. 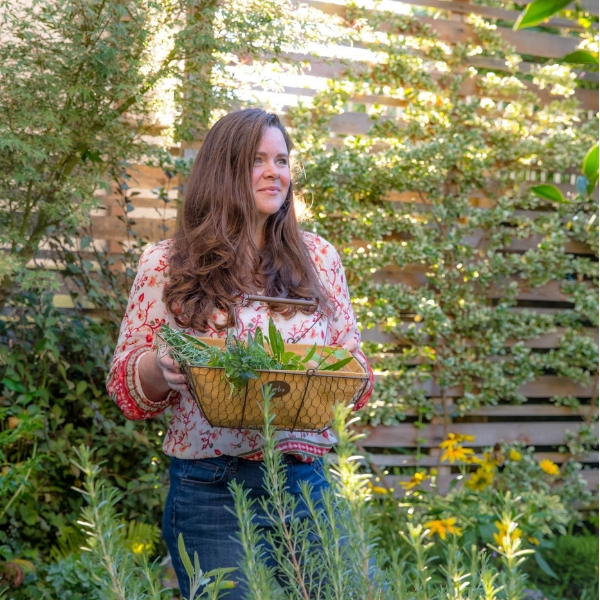 With wet fingers roll the flattened and together to create a decorative top. 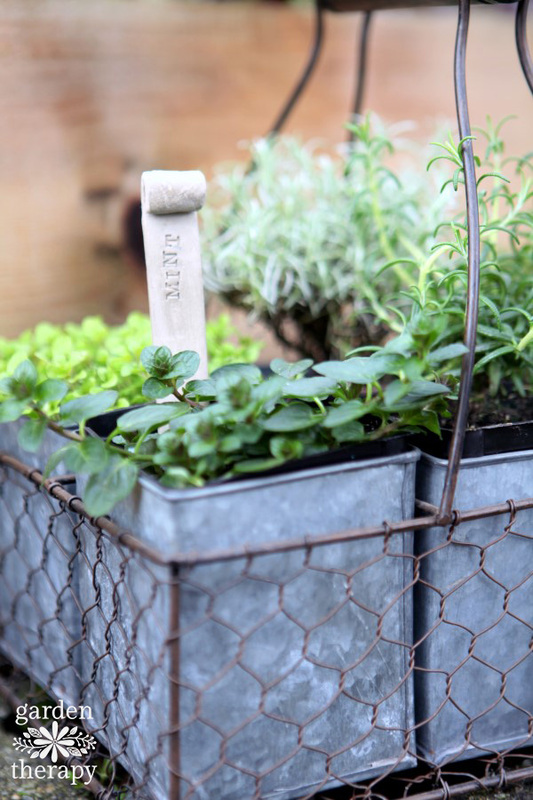 Use a sponge and some water to smooth out the edges of the plant tags. 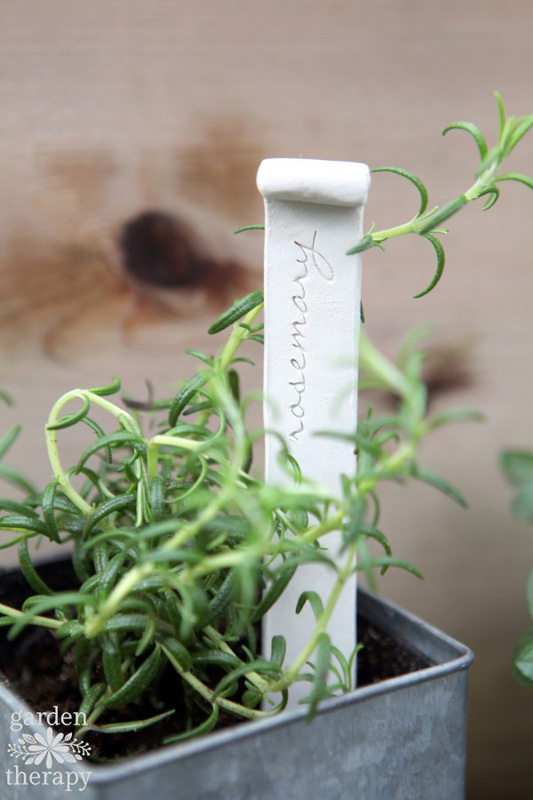 Use rubber stamps with herb names, letters, words, or organic elements like leaves and flowers to decorate the plant stakes. Allow to dry according to package instructions. 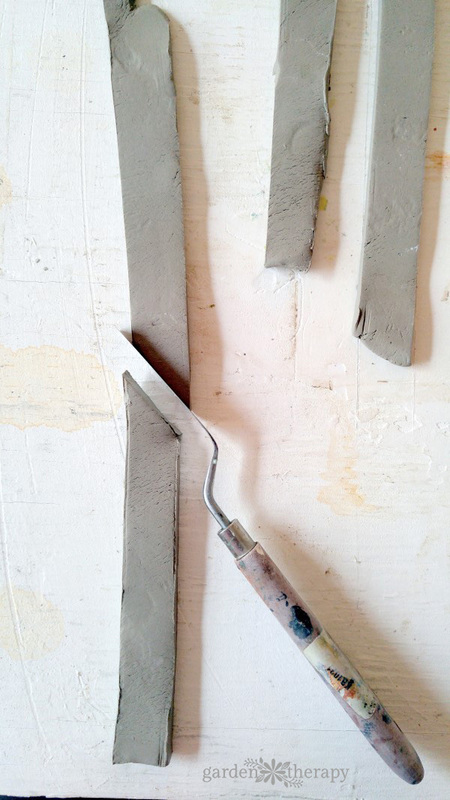 When completely dry use a fine sandpaper to smooth out any rough edges and finish the plant stakes. You can use craft paints to paint the clay if you wish. Or leave them natural and give them a coat of sealer for longevity. Two questions, please. 1) can these stay out year round, 2) where do you purchase the lettering stamps? My handwriting isn’t nice enough (legible, steady, etc) to write on clay. Hoping there is an inexpensive stamp to do this! 1.) no, you would want to use the oven bake (polymer clay) for that. These are indoor only. 2. I just used a set of alphabet stamps and word stamps used for paper crafts. There are some links for you in the materials list of the post so you can find them.